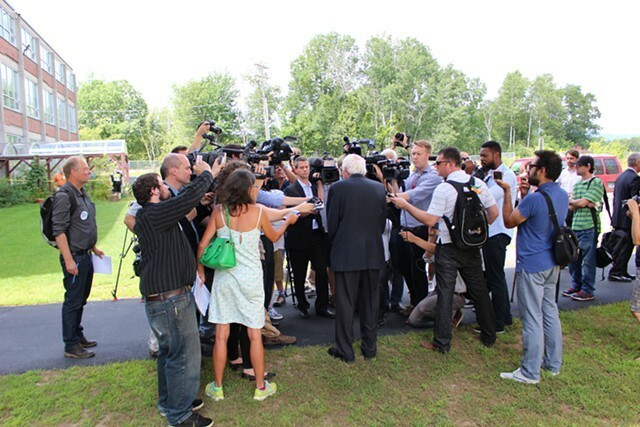 Sen. Bernie Sanders addresses the national media in New Hampshire in August. Sen. Bernie Sanders (I-Vt.) stepped up his longstanding criticism of the national news media last weekend, complaining in a Friday press release that his presidential campaign "has been all but ignored" by television network newscasts. "It’s no shock to me that big networks, which are controlled by a handful of large corporations, have barely discussed our campaign and the important issues we are bringing up," Sanders said Saturday in an email to supporters. "They’re just too busy covering [Republican presidential candidate] Donald Trump." But even as Sanders rails against what his campaign refers to as a "Bernie blackout" in the national press, several reporters in his home state of Vermont complain they've had little to no access to the candidate since he launched his campaign last April. "It's a little disappointing for a person who has been so accessible in the past to be frozen out like this," says Vermont Public Radio news director John Dillon. "You understand it from a pragmatic point of view. He's more concerned with Iowa than he is with Irasburg. But he's still our senator." According to Dillon, Sanders agreed to two interviews with VPR last summer in Washington, D.C., as the station prepared an hourlong documentary on the candidate. But the senator has declined to appear on VPR's daily public affairs show, Vermont Edition, since March — even though its producers have promised to "clear the schedule" if he made himself available, Dillon says. The station also routinely asks to speak with Sanders about his votes in the U.S. Senate. "He never calls back," Dillon says. "Whereas, before he was a candidate, he would always want to get in those stories. Sometimes he would call us before we would even call him — and that's not the case now." Neal Goswami, who covers state and national politics for the Rutland Herald and the Barre-Montpelier Times Argus, has had even less access. Though Goswami has traveled to Iowa and South Carolina to report on Sanders' campaign, he says his repeated requests for a one-on-one interview "have either gone ignored or were outright denied." "The only interaction I've had with Sen. Sanders since he launched his campaign was a media scrum in Iowa in which they allowed me to ask one question," he says. "So largely I've been sort of blocked out from being able to ask questions of the senator." Goswami says he finds it "a little ironic" that Sanders is complaining about being ignored by the national press corps while he himself is ignoring the Vermont press corps. The reporter says he understands that Sanders expects to "clean up here in the Vermont primary" and "doesn't have to worry about local voters anymore." But he argues that Sanders still has an obligation to speak with his home-state media. "I find it troubling that his Senate office continues to pump out press releases to Vermont reporters expecting us to cover it," Goswami says. "His campaign can't be bothered to take some questions from us." Sanders' latest digs at the national press revolve around a new finding by media analyst Andrew Tyndall, who logs every minute of the three television broadcast networks' nightly newscasts. In the first 11 months of 2015, he found, the networks' flagship programs devoted 234 minutes to Trump — 27 percent of the presidential campaign total — and just 10 minutes to Sanders. ABC News spent 81 minutes covering Trump in that period and about 20 seconds on Sanders, Tyndall reported. That led Sanders to "ratchet up" his attacks on the national news media during events across Iowa last weekend, according to CNN. "We are taking on a corporate media establishment that tells us everything we need to know except what’s most important for working families," he told supporters Sunday at Cornell College in Mount Vernon, according to the Washington Post. Complaints about coverage are nothing new for Sanders, who has criticized the press since well before he was elected mayor of Burlington in 1981. "I chuckled when I saw him complain about the media [last weekend] because in his early years that used to be part of the playbook — that we didn't cover his events," says WCAX-TV news director Anson Tebbetts, who has covered Sanders for decades. The criticism has gone both ways. Vermont reporters have long chafed at Sanders' unwillingness to answer questions outside his comfort zone. After the Sandy Hook Elementary School mass shootings three years ago, Sanders refused to speak to Seven Days about his views on gun rights for nearly three months. "We've all been in a place where you're covering a news conference and Sen. Sanders doesn't want to go off-topic," Tebbetts says. Vanguard Press political columnist Peter Freyne made a similar point three decades earlier at a 1985 forum on the media held at Burlington City Hall and featuring then-mayor Sanders. 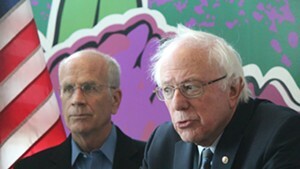 "In terms of politicians manipulating the news, you've mastered the art," Freyne told Sanders. "When asked a question you don't want to answer, you leave the room. You got up and walked right out of here." When Freyne, who later worked for Seven Days, slammed Sanders for falling short of his commitment to hold press conferences every two weeks, the mayor said, "Peter, you are basically a gossip columnist. You like gossip." Asked this week about his boss' unwillingness to speak with Vermont reporters, Sanders spokesman Michael Briggs took a similar approach. "Anyone who looks at TV or reads a Vermont newspaper knows that your argument is patently untrue," Briggs told Seven Days. "As Bernie has traveled around the country, he has not been able to spend as much time with Vermont reporters as he once did. Within those scheduling constraints, however, Bernie enjoys speaking with the many serious Vermont journalists who are interested in discussing important issues facing our country — not gossip." Asked which "serious Vermont journalists" he's been speaking to, Briggs did not respond. Jasper Craven, who reported for the Herald and Times Argus from Washington, D.C., in the summer of 2014, says he spoke with Sanders frequently back then. But since becoming VTDigger.org's political reporter four months ago, he hasn't landed a single interview. His boss, Digger founder and editor Anne Galloway, says Sanders hasn't spoken to the online nonprofit news outlet since he joined the presidential race. "Every time I'm on the trail I ask Briggs for an interview, prod him along a little bit and see what I can finagle," says Craven, who has traveled to Nevada, South Carolina and New Hampshire to cover the campaign. "He usually smiles and says he'll do what he can." Sanders has not granted Seven Days an interview since April 30, the day the senator declared he would enter the presidential race. Campaign manager Jeff Weaver and senior strategist Tad Devine have both made themselves available, as they have to other Vermont news organizations. Dillon, the VPR news chief, says he understands that Sanders' time is better spent speaking with the national media, but he argues that the Vermont press is uniquely capable of performing a different role. "On issues such as gun control or race or foreign policy that have flared up in the campaign, someone like [VPR reporter] Bob Kinzel, who has covered Sanders for close to 25 years or more, might be able to ask a question that wouldn't occur to a national political reporter who's just jumped on the campaign trail," he says. According to Dillon, former governor Howard Dean "would always make time" for VPR when he was campaigning for president during the 2004 election and once hosted an hour-and-a-half call-in show from Iowa with the station. "When Dean was No. 1 in the polls, he was still talking to Vermont reporters," Dillon says. Tebbetts, the WCAX chief, remembers that campaign differently. "My recollection is we struggled at times to get access to Howard Dean," he says, adding, "Maybe that was just me." Tebbetts says he has "no complaints" about Sanders' availability these days. The candidate has occasionally spoken with WCAX reporters — and sat down with anchor Darren Perron for an extended interview last month in City Hall Park. WPTZ-TV president and general manager Kyle Grimes says much the same. Sanders spoke with WPTZ the day he announced in April, last month in City Hall Park and again in November on the station's new Sunday public affairs show, "Matter of Fact." "We've found him to be reasonably accessible, given that he's running for president. His staff has been accommodating, when logistically possible, with us," Grimes says. "So I don't think we've found it to be out of what our expectations were, given the office he's running for." Both WCAX and WPTZ have significant audiences in New Hampshire, home of the first-in-the-nation primary election. Tebbetts says he has just one complaint about the 2016 field: "My biggest concern has been access to Hillary Clinton, which has been nonexistent," he says. "We have repeatedly asked for access to Hillary Clinton and have been denied." Clinton's campaign declined to comment. Sanders, of course, declined a request for an interview.